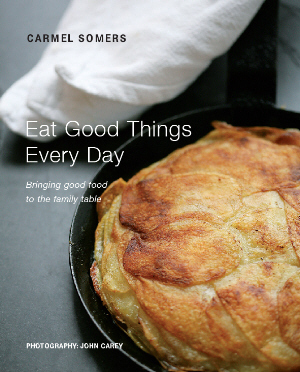 Cook ahead, shop ahead, think ahead – those are the main points of Carmel Somers’ first cookbook. Somers is the chef/owner of the Good Things Café, an acclaimed restaurant and popular cookery school in Durrus, West Cork. Eat Good Things Every Day, however, is not in the least bit cheffy. It is all about simple family dishes, often lifted with an unexpected ingredient: an apple in a cabbage stir fry with pork belly, bananas fried to accompany a Cuban rice dish, raw rhubarb tossed in a salad with cucumber and mint. There is a satisfying heft about Cornucopia at Home, an approachable collection of recipes from one of Dublin’s best-known vegetarian restaurants. Written, photographed and designed by former staff, this handsome volume is a labour of love – and it shows. Although we had at least a week of summertime flip-flop days, May seems to have regressed to the cold and damp of early April. Weather like this – today it rained for the afternoon and just didn’t stop – means a return to cold weather soup recipes, warming comfort food for wintery-feeling evenings. 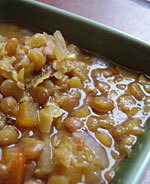 This lentil soup recipe – for I believe that you can never have too many lentil recipes in your repertoire – is from Domini Kemp, of Itsabagel fame (all time favourite bagel? Definitely a Mountaineer), and was published in one of her Irish Times pieces a few weeks ago. I made it that very week and we loved it but then finer weather (and PSB) came on the scene so I put away my soup recipes – but not for too long, as it turned out. If you’re in New Zealand at the moment, you’re probably celebrating Waitangi Day on the beach or with a picnic. You could do something similar in Ireland but you wouldn’t last long on a wind- and rain-swept beach and picnics really need to be at home in front of the fire! This wintery weather lends itself very much to warming soups so, after chancing on some lovely sweet potatoes in Fermoy’s last remaining veg shop, I decided that it was time to make Meg’s Spicy Lentil and Kumara Soup – kumara is a Maori sweet potato that we eat a lot of when we are in New Zealand but can’t get in Ireland. The sweet potatoes that I picked up weren’t a bad substitute, though, I’ll definitely be back to get some more to make more kumara recipes. Now, time to make some Anzac Biscuits for a real Kiwi treat – although I guess I should really be making a Pavalova!